These are the BEST NUTELLA BROWNIES EVER – one bowl, no mixer, just TONS of chocolate. They’re so fudgy and rich they are the PERFECT brownie recipe! It’s going much better than the first week or two. She’s growing – up to about 7 pounds I think and her body is getting bigger. She’s had her second set of shots and is still under a quasi-quarantine but the vet said it would be okay to start training so we are looking into it. Her favorite things are: me, chewing on boxes, her rope toy, me, chewing on furniture, me, chewing on me, and me. Once a day or so she goes to Mel for a ear rub and to Jordan to bite her hair, and then she comes back to…me. Sleeping is going much better too. At first she would cry for hours in her crate next to the bed, then she’d only cry if I moved, or turned over, or breathed too heavy. Now she doesn’t cry at all…ever since I let her start sleeping in the bed with me, that is. ? 14 years of furry spooning in my future! But seriously…I was starting to go crazy from lack of sleep. I’ll take her hot dog breath over being awake all night in a heartbeat. Making new recipes has been…interesting. It’s totally fine when I’m just making something simple and taking photos. Taking video is another story…but I try to tire her out before I start so she naps throughout my baking marathon. In fact, she slept at my feet the entire time I made these brownies. I’m not exaggerating either: she was at my feet when I walked to the microwave to melt the butter, at the pantry when I got out the Nutella, at my feet when I was mixing, under the tripod when I was shooting photos. Basically, we have a theme: Abby loves me. A LOT. I’m not even sure Mel and Jordan love me as much as she does. ? 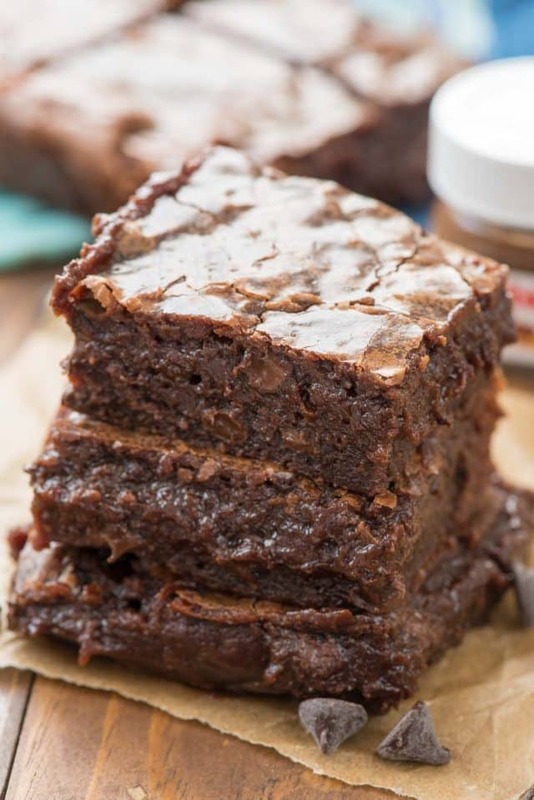 She wanted to try these EASY Nutella Brownies but luckily she can’t have chocolate…more for me. Easy Nutella Brownies have triple chocolate and are made in one bowl with just a wooden spoon. Everyone loves these brownies! I love Nutella. I regularly eat it with a spoon from the jar. That way the jar is MY jar because, well, I’ve eaten from it. Jordan loves it too; she’s always begging for those little packets with pretzels you get at the checkout counter. These easy brownies were right up both our alleys. I married my favorite melted chocolate brownie recipe with Nutella to create this one bowl EASY recipe. It’s got tons of melted chocolate, chocolate chips, AND Nutella inside. It’s chocolate to the extreme and then you add all the other amazing ingredients like butter and sugar and, well, this is brownie heaven. The end result, if you under bake them just a bit, is a gooey chocolatey masterpiece that I dare you to share. Go on, try it. Don’t go near the pan with a fork. You’ve been warned! I used bittersweet chocolate for this recipe. 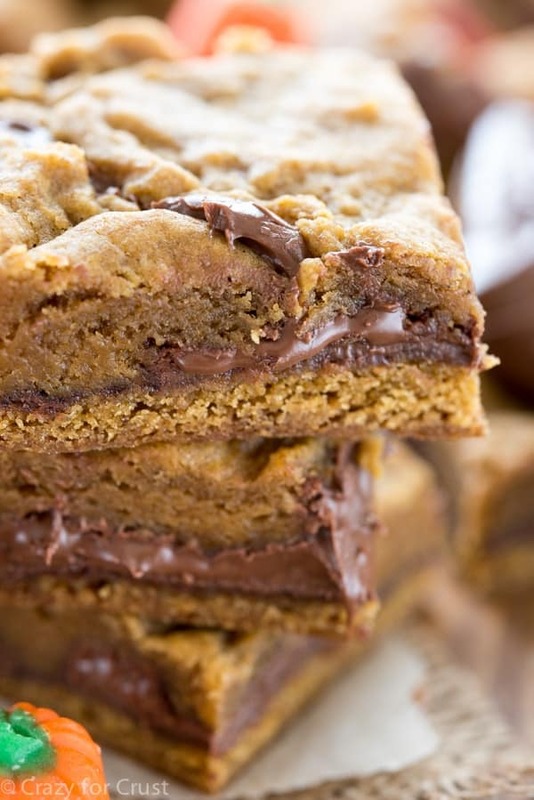 Adding the Nutella makes it the perfect sweetness. You can also use unsweetened. The chocolate chips add a nice rich flavor to the brownie. Be sure to under bake by a few minutes for the gooiest and perfect brownies. These are the BEST NUTELLA BROWNIES EVER - one bowl, no mixer, just TONS of chocolate. They're so fudgy and rich they are the PERFECT brownie recipe! Preheat oven to 350°F. Line a 9x9” pan with foil or parchment and spray with nonstick cooking spray. 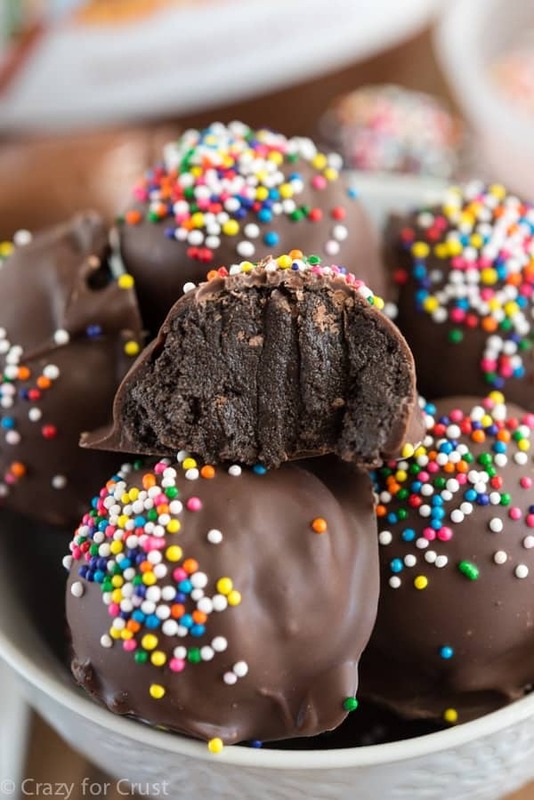 Place baking chocolates and butter in a large microwave safe bowl. Heat in 30 second increments, stirring between each, until melted and smooth (about 2 minutes depending on your microwave). Stir sugar into chocolate mixture, then stir in eggs until well mixed. Stir in the Nutella, then add the vanilla and salt and stir until smooth. Carefully stir in the flour, then stir in the chocolate chips. Pour batter into the pan and bake for about 20-25 minutes until a toothpick comes out with just a few crumbs an inch from the side of the pan. I like to make these a little underdone so they stay fudgy and rich. 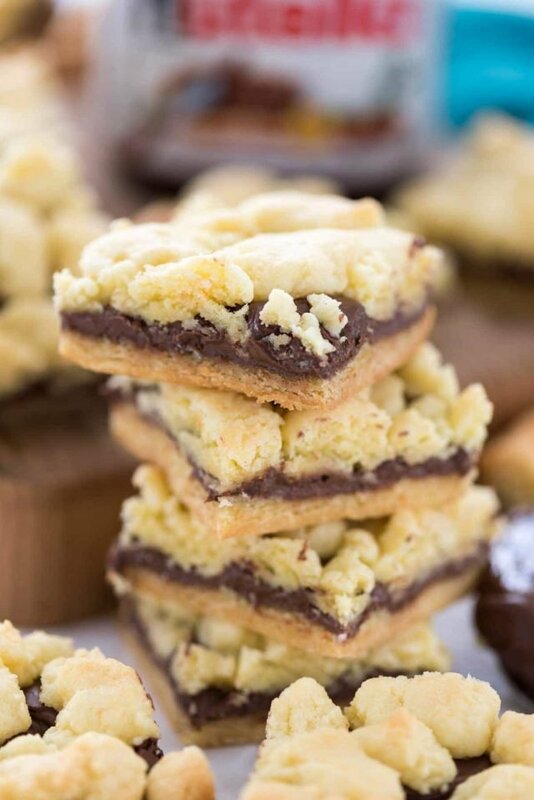 If you love Nutella, be sure to check out all my Nutella recipes, and you might also like Nutella Oreo Icebox Cake from Inside BruCrew Life, Nutella Pumpkin Dip by Wine & Glue, or Nutella Baklava by The BakerMama. I think that your soul mate has found you, aka Abby 🙂 I lol’ed when you said you’re not even sure if Mel or Jordan love you this much! Nutella brownies sound like just the best dessert! And Abby sounds adorable! Love the Abby update almost as much as that pic of these brownies. 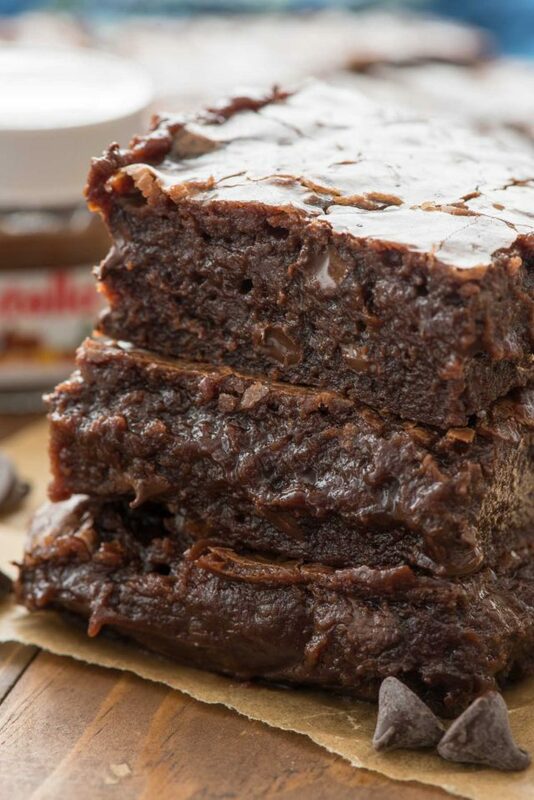 Abby curled up at your feet or in your bed + a pan of these Nutella brownies = LOVE! She sounds like the sweetest lil baking companion 🙂 Can’t wait to make these….love Nutella anything!!! What, no photo of Abby included? ?